Selecting the finest Concort grapes, our 100% Red Grape juice has a fragrant and sweet flavor with a hint of sourness. 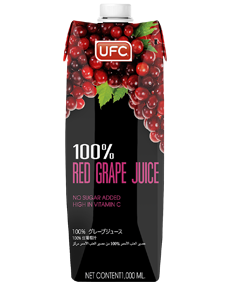 In addition, UCLA researchers have claimed Concort grapes juice the third healthiest beverage in the world. This is primarily due to its high antioxidant levels which helps reduce changes heart decease, cholesterol level, artillery blockage and cancer. This product does not contain any preservatives, sugar and food colouring.